Cory has tried to get into the Navy SEALS, but wasn't able to hack training. Instead, he is part of the Navy's Marine Mammals Program and has trained a dolphin named Kaj to hunt bombs and other items under water to make the seas safer for the Navy, if not for Kaj! Unfortunately, Cory is still struggling with an event in his life. While out surfing, he and his younger brother Aaron were attacked by sharks. Cory was okay, but Aaron spent three days in the hospital, and Cory feels responsible. He is scared of being in the open waters, scared that sharks will again be a danger, even though he knows that the statistical probability is low. Cory and Kaj are sent to the Sea of Japan and are assigned to retrieve a sensitive piece of equipment that has been lost in North Korean territory. Cory, nervous about everything and feeling that the Navy SEALS know about his failure and are laughing at him, is still determined to make sure that Kaj does the job he was trained to do so he can prove himself to the Navy, but he also wants to keep Kaj safe. Major Landon is sceptical about the "fish" doing a good job, but he is impressed by Cory and Kaj's skills. The mission runs unto trouble, though, when a North Korean trawler turns out to be more than it seems. Men are killed and military security is at stake, and only Cory and Kaj have the abilities needed to save the day. Strengths: Like the fabulous Dog Tags books, this shows a ton of research into little known military practices. I can't find the post related to Travis Jonker's assertion that all MG books should be 200 pages of less that claimed that there should be no more World War II middle grade books, but I still have so many readers who want war books, and this is just perfect! 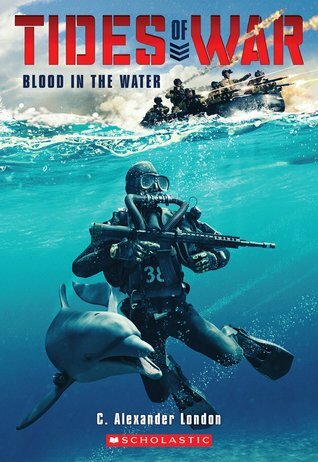 It's modern, has lots of suspenseful military action, cool dolphin tactics, and Cory is afraid. Not only is he afraid, but Landon tells him that's okay-- he'd be crazy if he weren't. But Cory is also brave and very loyal to Kaj. This was superb. Weaknesses: PAPERBACK??? The life of a paperback in my library is about three circulations. Hardcover or prebind is the only way to go, and prebinds take a while. In some cases, they are never available. I would buy two hardcover copies of each of the Tides of War and Dog Tags series books if they were only available! There is not enough clear tape in the world to reinforce paperbacks to make them hold up to being toted around by the average 6th grader! 6 January 2015, Scholastic Paperbacks. "A notorious Somalian pirate sails the Arabian Sea, leading a band of deadly thieves and mercenaries on an international crime spree. 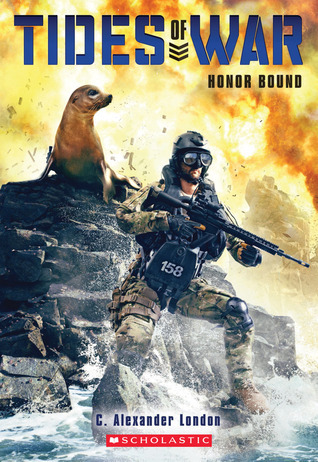 When they take American hostages aboard a cargo ship, they've finally gone too far -- and a special task force of Navy SEALs and Marines is called in to help. SEALs, Marines . . . and a talented sea lion named Sly. As Sly's handler, young sailor Felix has two important jobs. Job one is to get Sly to plant a beacon so that the U.S. strike force can follow the pirates back to their haven. Job two is to keep the sea lion safe and out of combat. But when the mission goes wrong and the pirates get the upper hand, Felix and Sly end up right in the middle of the action . . . with dozens of innocent lives at stake."